The Dictionary of Modern American Philosophers (DMAP) was published by Continuum in 2005. The oldest DMAP figure still living? Deaths since DMAP was printed? The Dictionary of Modern American Philosophers, which contains 1082 entries by over 500 authors, provides an account of philosophical thought in the United States and Canada between 1860 and the present. A dictionary for early American philosophers from the colonial period to the Civil War is in preparation. An envisioned dictionary for Latin America will encompass Mexico to complete the coverage of North America. Even after these dictionaries are all published, scholarship advancement, new information, and error detection will demand updating and enlargement in electronic format. Suggestions for additions, improvements, and corrections are welcome and may be communicated to the general editor. Each entry begins with biographical and career information in the opening paragraphs. The main body of each entry discusses the subject’s writings, teaching, and thought. A cross-referencing system refers the reader to other entries. The concluding bibliography can contain as many as three sections. The initial section contains the more significant publications by the subject, typically monographs and major articles. 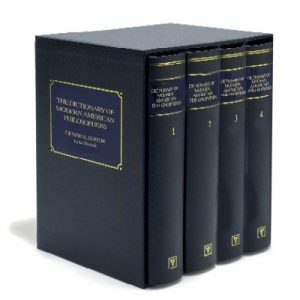 The second section, “Other Relevant Works,” contains additional publications that typically include more articles and book chapters, posthumous editions and collected works, edited books, translations, autobiographies, or non-philosophical works of interest. This section will also locate the figure’s archived papers, if known. The third section, “Further Reading,” contains citations to standard biographical works that also include the subject such as American National Biography, and also lists publications about the subject. The chronological boundaries of the Dictionary are set by including figures who produced significant philosophical thought in the U.S. or Canada between 1860 and the early 1960s. The birth dates of the Dictionary’s thinkers range from 1797 to 1942. The earliest works mentioned in some entries date from around 1820, and the latest are from 2005, so nearly two hundred years of philosophy is covered by the Dictionary. Figures who died soon after the Civil War, such as some elderly Transcendentalists, are included even though most of their publications appeared in the 1840s or 1850s. The Dictionary includes foreign-born philosophers who spent as little as a decade in the U.S. or Canada, provided that they made contributions to philosophy while here, such as the Europeans who fled Nazi persecution and World War II. To select those who were active by the early 1960s, the Dictionary editors considered those born by 1935 and who earned their terminal degree by 1962, although a few figures born between 1935 and 1942 who made the greatest impact on late twentieth century philosophy are also included. The distribution of birth years of figures in the Dictionary is as follows: 209 were born between 1797 and 1860; 170 were born between 1861 and 1880; 177 were born between 1881 and 1900; 263 were born between 1901 and 1920; and 263 were born between 1921 and 1942. The philosophers of the generation born after World War II, while not lacking in impact, have not yet concluded their work and some historical distance is still required for proper judgment. The label of “philosopher” has been broadly applied in this Dictionary to intellectuals who have made philosophical contributions regardless of academic career or professional title. The wide scope of philosophical activity across the time-span of this Dictionary would now be classed among the various humanities and social sciences which gradually separated from philosophy over the last one hundred and fifty years. Many figures included were not academic philosophers but did work at the philosophical foundations of such fields as pedagogy, rhetoric, the arts, history, politics, economics, sociology, psychology, linguistics, anthropology, religion, and theology. Philosophy proper is heavily represented, of course, encompassing the traditional areas of metaphysics, ontology, epistemology, logic, ethics, social/political theory, and aesthetics, along with the narrower fields of philosophy of science, philosophy of mind, philosophy of language, philosophy of law, applied ethics, philosophy of religion, and so forth. It should be remembered, however, that professional philosophers have had no monopoly on these philosophical fields, especially before World War I. There are a large number of entries, for example, about important theologians who made contributions to philosophy of religion and philosophical theology. In nineteenth century terms, the Dictionary includes theologians who did “systematic” or “speculative” theology (rather than those who practiced only dogmatic or apologetic theology). Likewise, the Dictionary contains major physicists, biologists, anthropologists, linguists, psychologists, cognitive scientists, sociologists, economists, political theorists, cultural critics, literary critics, composers, artists, and architects who philosophized about their field and influenced other philosophers. Social reformers whose writings manifest philosophical concerns in a sophisticated way, such as deliberations on gender or racial equality, social justice, political liberty, etc., are another significant category of thinkers in this Dictionary. The Dictionary entries vary in size from a minimum of around five hundred words to a maximum of four thousand words. Entry size should not be construed as resulting from an editorial attempt to measure some intrinsic philosophical value of the figures. The editors planned for roughly one-third of the entries to be more than sixteen hundred words, and those thinkers may indeed be judged among the more significant among their contemporaries. However, many variables, including availability of information, author enthusiasm, attempts to give extra space to figures ignored by other reference works, and many more factors, together yield a great deal of variation. Since the primary purpose of this Dictionary is to preserve valuable information about as many thinkers as possible, its virtue lies in its wider historical breadth rather than its analytic depth. By including not only every well-known thinker but also a vast number of lesser known thinkers surrounding the “great philosophers” with support, criticism, and intellectual context, the story of the evolution of philosophy in the U.S. and Canada become visible in broad outlines. Indeed, the number of intellectual disciplines and fields of philosophy in this Dictionary is so large, the representation of diverse schools and movements of philosophy is so successful, and the inclusion of so many women and minorities (130 figures) is so pluralistic, that it make a large contribution to the study of modern intellectual life in these two countries. The editors have sought to ensure that the breadth of significant philosophical activity finds representation in the Dictionary in many ways beyond those already mentioned. For example, recognition by one’s peers is one useful measure, so nearly all of the presidents of the three divisions of the American Philosophical Association are included, along with many presidents of numerous regional and topical philosophical societies, such as the Southwestern Philosophical Society, the Metaphysical Society of America, and the Philosophy of Science Association. The Dictionary also includes philosophers from nearly every geographical section of the U.S. and Canada. Furthermore, nearly every one of the 105 universities that had a doctoral program by 1970 has one or more of their philosophers included here. The Dictionary also has many entries on the first philosophers to teach at these major universities, as well as their more recent successors, so that the histories of over one hundred philosophy departments in the U.S. and Canada, along with many smaller college departments, are sketched from the perspective of individual professors. The story of philosophy in North America comes to life in this Dictionary at its most personal level: in the varied careers of the thinkers themselves, from poet, priest, and politician to abolitionist, socialist, and civil rights activist; often alongside their academic position. Public fame and recognized service are not necessarily incompatible with a philosophical life. Among the Dictionary figures are an author of an Amendment to the U.S. Constitution (Susan B. Anthony); a Roman Catholic Cardinal (Elzéar-Alexandre Taschereau); two founders of new religious movements (Mary Baker Eddy and Helena Blatavasky); two United States Commissioners of Education (William T. Harris and Sterling McMullin); two martyred African American leaders (Martin Luther King, Jr. and Malcolm X); three Presidential Medal of Freedom awardees (Alexander Meiklejohn, Walter Lippmann, and Sidney Hook); four pioneers of environmentalism (Joseph Wood Krutch, Aldo Leopold, Rachel Carson, Holmes Rolston, III); five U.S. Supreme Court Justices (Louis Brandeis, Benjamin Cardozo, William Douglas, Felix Frankfurter, and Oliver Wendell Holmes, Jr.); and fourteen Nobel prize winners (Jane Addams, Kenneth Arrow, Emily Greene Balch, P.W. Bridgman, James Buchanan, Nicholas Murray Butler, Albert Einstein, T.S. Eliot, Milton Friedman, John Harsanyi, Martin Luther King, Jr., John Nash, Amartya Sen, Elie Wiesel). The mundane realm of technology is here revealed to be thoroughly intertwined with philosophy as well – for example, consider the evolution of the computer, through the work of Charles Peirce (first to recognize the connection between Boolean algebra and electric switch circuits), Allan Marquand (first to design an electromechanical digital machine), Arthur Burks (helped build the first general-purpose electronic computer ENIAC), and John Kemeny (wrote the BASIC computer language). More examples of diverse philosophical achievement could be enumerated, too many to list here, but how many philosophers have climbed Mt. Everest (Stephen Kleene), have a high mountain peak named after him (Josiah Royce), or inspire the naming of an asteroid (Paul Kurtz)? Even the less exciting but still rewarding career as a college professor of philosopher could entail very different responsibilities across the timeline of this Dictionary. Very few philosophy positions in American academia existed in 1860, and were typically attached to the title of college president and carried clerical qualifications. With very few exceptions, only ministers approved by a college’s religious denomination could then teach philosophy, and at almost all colleges save for the largest like Harvard, Princeton, and Columbia, the college president was usually assigned the responsibility for teaching philosophy (meaning moral and social philosophy as the denomination viewed it). Before 1860 only a few colleges, such as Harvard, Princeton, Andover Theological Seminary, and Union Theological Seminary, offered any post-graduate education and the possibility of advanced training in philosophy. In 1866 Yale awarded the first American PhD in philosophy, to Charles Fraser MacLean who became a judge in New York. Yale was soon followed by Harvard (1878 – G. Stanley Hall), Johns Hopkins (1878 – Josiah Royce), and Cornell (1880 – May Preston Slossen, the first American woman to receive a philosophy doctorate). Around half of the philosophers educated between 1870 to 1910 spent some time at German and French universities for additional philosophical study, and this experience contributed to the gradual liberalization and sophistication of religious and speculative thought to North America. From 1860 to 1880, academic philosophers were scattered across the landscape, found only at the more prestigious colleges and usually working alone as the person holding the one chair of philosophy at their institution. Although the titles of Professor of Moral Philosophy and Professor of Intellectual Philosophy had become more common and independent from the position of college presidency or minister by 1890, advanced philosophical training and skill was possessed only by at most eighty of these professors in the U.S. and Canada. Some of the most important philosophical creativity was still generated by theologians during that era, especially those who creatively struggled with the internal tensions of their faith’s doctrines, the challenge of evolution, or the plight of the labor class. Another fertile source of philosophical thinking was coming from the new category of “social scientist” composed of scholars searching for remedies to social problems. The Dictionary recounts in the lives of its figures how philosophy was gradually liberated from denominational creeds as modernizing universities tried to imitate the German model, with a broadly scientific mission and many separate departments of specialists publishing their research. 1866–67 was the greatest turning point with three key events: the first American PhD in philosophy in 1866, the founding of America’s first philosophy journal, Journal of Speculative Philosophy, in 1867, and the publication of Charles Peirce’s first series of essays on logic in 1867. The next generation of academic philosophers, like Josiah Royce, John Dewey, James Mark Baldwin, and George Santayana, found their positions in the 1880s and 1890s without a theological degree or clerical ordination. Their degrees were from German universities or from the few American universities offering the new PhD degree. The professionalization of philosophy was swiftly achieved in the early 1900s, as enlarged universities divided the various social sciences apart from philosophy, and philosophy departments inflated by hiring the newly minted PhD graduates of Harvard, Princeton, Yale, Cornell, Columbia, Johns Hopkins, and Chicago. These graduates were imbued with a sense of national importance. The closing of the frontier in 1890 signaled the inward shift of America’s manifest destiny to its classrooms. It also coincided with the growth and importance of philosophy as the basis from which to craft a new type of intellectual pioneer, one able to comprehend and articulate the unprecedented problems and challenges of the next century. By a conservative estimate the number of academic philosophers tripled from 1880 to 1910, a rate comparable only to the dramatic increase of philosophy positions from 1945 to 1952 and again during the late 1960s. Academic and intellectual growth is a major theme displayed by the Dictionary, but the long-delayed recognition of philosophical talent in women and minorities is evidenced in the Dictionary as well. Christine Ladd-Franklin was denied her earned diploma from Johns Hopkins in 1882, as was Mary Whiton Calkins in 1895 who never received her Harvard doctorate. By 1940 only a handful of women had taught as regular philosophy faculty at major universities. The small presence of Native Americans who came to philosophy only through other disciplines, and the prejudice toward the few Jews in philosophy before 1950, is similarly evident in the Dictionary, although it should be noted that a large number of Jewish philosophers found refuge in American and Canadian institutions during World War II. Despite Alain Locke’s path-breaking achievement as the first African American PhD in philosophy (from Harvard) in 1918, few have been able to follow him to academic prominence. In the 1940s the only African American philosopher at an Ivy League university was William Fontaine at Pennsylvania, and little improvement can be seen since. Other religious and ethnic minorities also have suffered neglect and prejudice too extensive to recount here. However the history of philosophy in the U.S. and Canada may be judged by its treatment of women and minorities, this Dictionary was designed to present the lives and careers of a broad and diverse array of philosophical intellectuals. Despite the editors’ best efforts, future centuries may yet judge this Dictionary and its inclusion choices to be erratic at best or seriously flawed at worst. Charles Hutton’s impressive Mathematical and Philosophical Dictionary of 1796 omitted John Locke and David Hume, after all – so some true philosophical genius has probably eluded this dictionary’s editors. Still more provoking is the thought that this dictionary contains large entries on figures who will someday be deemed beneath consideration by future historians of philosophy. Still, it is hoped that this Dictionary will satisfactorily reveal what this era considered philosophically interesting, stimulate closer attention and research into philosophical thought in the U.S. and Canada, and help make future enlightened judgments possible.